On this occasion I used cherries, but fruits such as strawberries, grapes and gooseberries work just as well. You will need about 60g/2oz chocolate to coat 12 fruits. Milk, dark or white chocolate all work well. Chocstress tip* use twice the amount of chocolate needed because eating the leftover melted chocolate is one of life’s great pleasures. Melt the chocolate in a dish over a pan of simmering water. Don’t have the heat too high and remember to take care and protect your hands from the steam. Half dip the fruits one at a time, allow the excess to drip back to the dish and then transfer to a sheet of greaseproof paper. Leave to set. *Impatient? Well, this is the ideal time to demolish the leftover melted chocolate. Stone (pit) the cherries using a small knife or a stoner, keeping the stalks intact is possible. 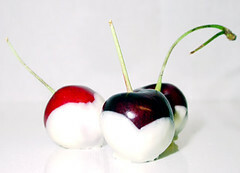 Place the cherries in a small bowl and add brandy – 2 tablespoons of brandy should be enough to cover 20 cherries. Cover the bowl and and leave overnight in a cool place. Drain the cherries and dry using paper kitchen towel. Follow the method above to coat the cherries in chocolate and again leave on greaseproof paper to set. Also works well with kirsch, amaretto or rum. The brandied cherries sound great! I’ll have to try that sometime (if I can keep from snacking on them while they’re in the bowl soaking). Oh man, the photos on this post are amazing. And the brandied cherries look down right delicious. Keep up the good work and tasty photos. Mmmmm…..
There’s a stall in Little Venice, London, where a guy dips strawberries in chocolate and serves them to customers. This is what heaven would be like if it existed. What is the white coating in the second picture? I made some cherry vodka, bottled the liquid and to save wasting the cherries coated them in dark chocolate. Yummy! That only I can say for your recipe.